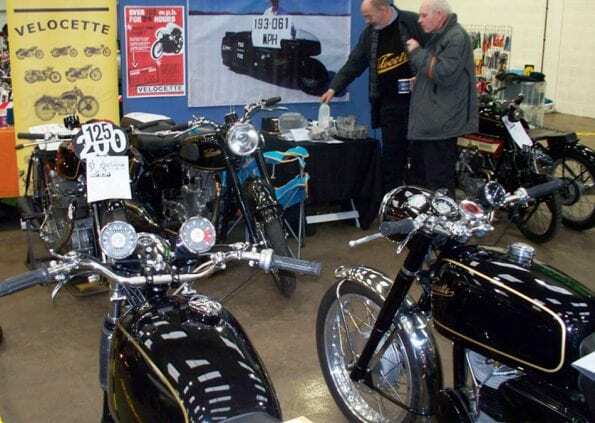 This was the sixth year that the Winter Classic had filled the halls at the Newark showground, just off the A1. 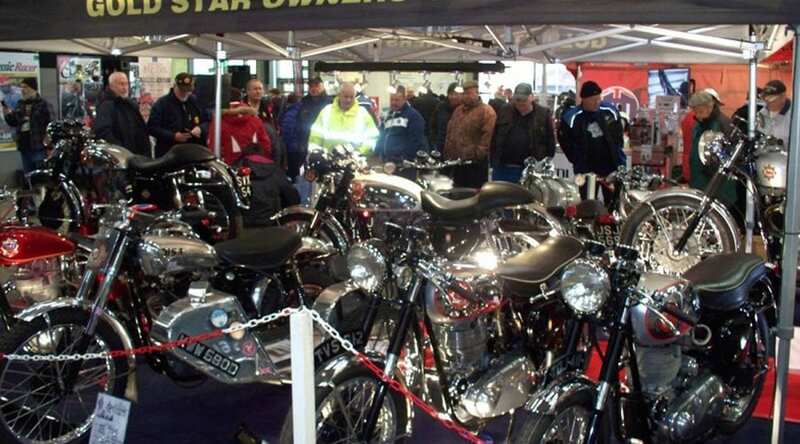 It’s usually the opening classic bike show of the year, on the first January weekend after the holidays. I arrived at early on Sunday morning, walking onto the showground and turning right into the George Stephenson Hall. Here I was able to ask where Jim D’arcy and Gordon May had their stands. Luckily Gordon’s was in this hall. I first met him when he set off on one of his motorcycle journeys from a Watsonian Squire open day. 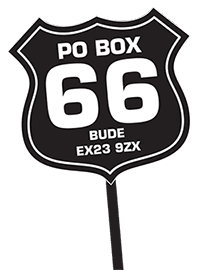 I had a nice chat with him about his latest book, which is about his ride to Vietnam on a 74 year old Matchless motorcycle. Starting off in this hall worked nicely for me, as Steve Plater was interviewing the Birchall brothers, and quite a crowd was developing around the stand. I made sure that I was in the first line of spectators. The interview was first class and all three guys were on top form. I had already heard from Gary Horspole, our local sidecar racer, that this season the engine sizes were being reduced on racing outfits and the Birchall brothers confirmed this. They have gone a step further and are already running with the smaller 600cc engine which is intended to make sidecar racing safer. Ben told us that he had to alter his riding style to suit the new engine. The 1000cc engines turn out 200bhp which, he said, can get exciting! Michael Dunlop has ridden their outfit and did quite well. The Birchalls hinted that Michael may race on three wheels this year; ‘watch this space’ they said. The boys and Steve were really on the ball, and it was a brilliant talk. I got lucky and had a few words with Ben, firstly at the stand and again in the queue for food. After my breakfast I continued to walk around the main hall, where there were a lot of club and trade stands. This show has machines of all makes and models through the ages and brings back plenty of memories. I spotted a Piaggio 50cc three-wheeler machine – similar to a tuktuk. This was fitted with a coffee machine in the back, and I was offered a cup of coffee. This mobile coffee bar was run by Debbie and Michael Ives who also had a nice selection of motorcycles for sale. They support their local charities and take the three-wheeler along; they charge £1 per cup and all the money taken goes to the charity. Attending the show on Sunday meant that the various show-winning machines had their rosettes on them, and this gave an added interest. I spotted three racing sidecars on the British Historic Racing Club stand. Here I got talking to a lady on the stand who passengers on a BSA twin outfit; she was racing at the recent Cadwell Park sidecar meeting that I went to. Luckily the weather was good for January – this is always nice for those traders outside. 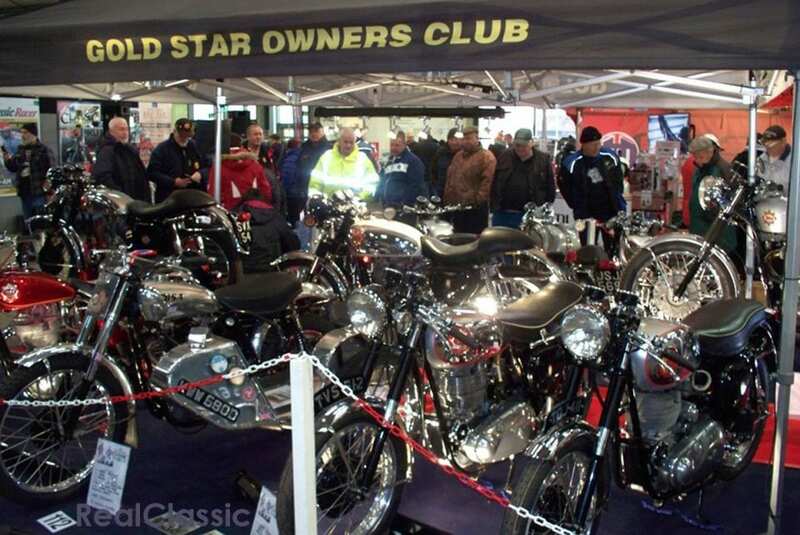 I wandered through the marquee area which housed all sorts of motorcycle-related kit for sale. If you are doing a restoration then the piece you want may well be here. Eventually I came to the Lady Eastwood Hall, again filled with lots of club and trade stands. Here I met up with Jim D’arcy and his friend Carl in much the same spot as last year. Talking to Jim he was pleased that the hall has been upgraded, and this year it was nice and warm in there. Jim and Carl had a nice selection of bikes for sale. Next I was off to Scooter World. This section had a hall to itself with quite a nice display of machines. Some of the owners have designed their own colour schemes and they are very good. Mau Spencer, the editor of a couple of scooter magazines, was very pleased with the turnout with 120 scooters on display. For the scooter riders Stuart Day, three-times British Scooter Champion, was there. He and the Birchall brothers and Steve Plater had a question-and-answer session going. Walking around I saw a scooter outfit on display that I had previously seen racing at Cadwell Park in the 125cc sidecar class. 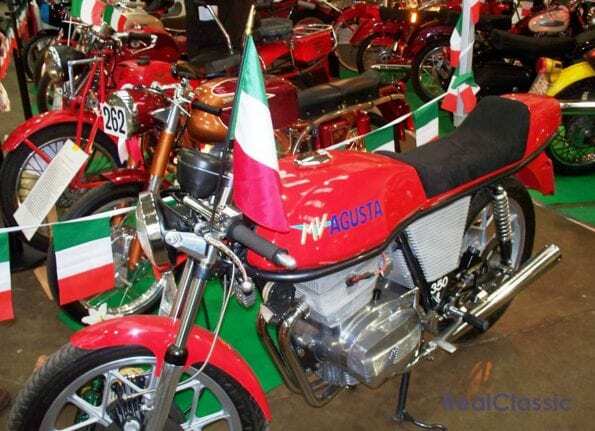 It is powered by an Aprillia RS engine. 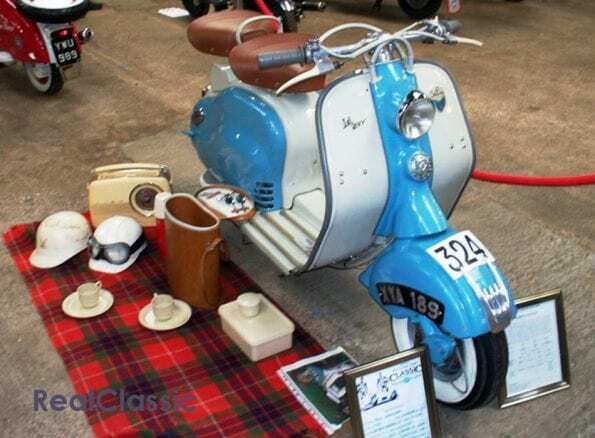 Plans to improve the outfit for next season were written on a board – these included (1) possibly some new tyres as the ones on the outfit are eleven years old; (2) to alter the rear wheel fairing because of a complaint from the passenger; and (3) a new fuel tank as the old one has a crack in the weld. Having watched this outfit buzzing around the track it goes well considering the engine size. What a great show, which was helped by nice weather – there were even some traders setting up stalls on the grass. 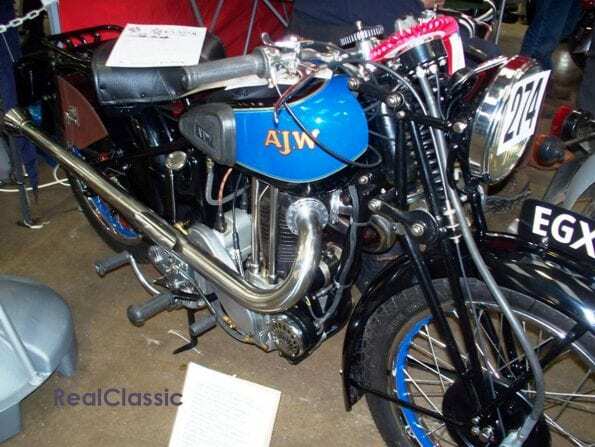 There was a good selection of machinery from many different countries (even an AJW like the one which appeared recently in the magazine), displayed by clubs and a large number of private entries. 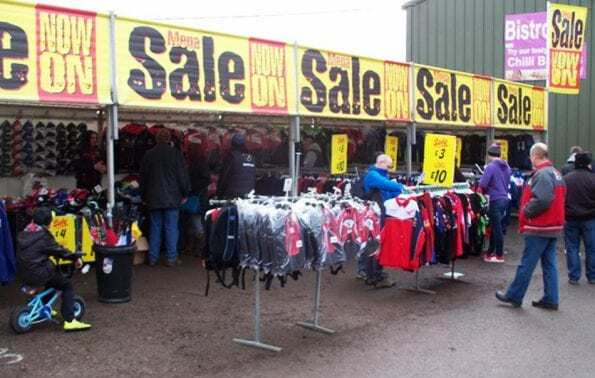 Also there were loads of trade stands, either packed into the halls or under the marquee – plenty of time to grab a bargain! There were many food outlets giving you a nice selection of something to eat. Well done to the organisers: I will be back next year.